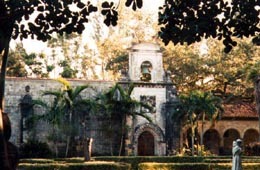 Miami Beach 411 : Tours : Spanish Monastery: Scroll down for information about the monastery located in North Miami Beach, Florida. The Monastery of St. Bernard de Clairvaux was built in Spain during the period 1133-1141. It was originally dedicated in honor of the Blessed Mother and named the "Monastery of Our Lady, Queen of the Angels." Upon the canonization of the famous Cistercian Monk, Bernard of Clairvaux, the Monastery was renamed in his honor. Cistercian monks occupied the monastery for nearly 700 years. The cloisters were seized, sold, and converted into a granary and stable due to a social revolution in that area in the mid 1830's. In 1925 William Randolph Hearst purchased the Cloisters and the Monastery's outbuildings. The structures were dismantled stone by stone, bound with protective hay, packed in some 11,000 wooden crates, numbered for identification and shipped to the United States. About that time, hoof and mouth disease had broken out in Segovia, and the U.S. Department of Agriculture, fearing possible contagion, quarantined the shipment upon its arrival, broke open the crates and burned the hay. The workmen failed to replace the stones in the same numbered boxes before moving them to a warehouse. Soon after the shipment arrived, Hearst's financial problems forced most of his collection to be sold at auction. The stones remained in a warehouse in Brooklyn, New York, for 26 years. One year after Hearts' death in 1952, they were purchased by Messrs. W. Edgemon and R. Moss for use as a tourist attraction. It took 19 months and almost $1.5 million dollars to put the Monastery back together. Some of the unmatched stones still remain in the back lot; others were used in the construction of the present Church's Parish Hall. There are 7 different areas to choose from for your wedding ceremony. All the locations are unique and beautiful. Each location has a different ambiance and the costs vary. There are 4 areas available for wedding receptions. They all vary in size and cost. The smallest area can hold up to 100 people. The rentals start at $800 when combined with a wedding ceremony. Note: Roman Catholic weddings are not permitted at this site by the Roman Catholic Church. • Exit #12B towards FL-826 East. • Turn Left onto NE 22nd Avenue. • Turn Right onto West Dixie Highway. • Spanish Monastery is located at 16711 West Dixie Highway.